Vital To Your Health, Delightful for Your Taste Buds! Avocados have a long list of potential health benefits. For example, besides its anti-inflammatory properties, previous research from Japan suggests this powerful fruit may also help protect against liver damage. 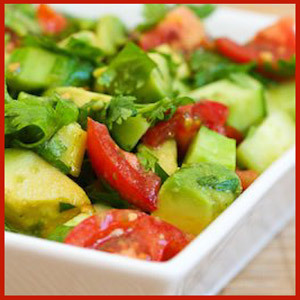 Furthermore, avocados are very high in potassium and can help balance your vitally important potassium to sodium ratio. Due to its beneficial raw fat content, avocado enables your body to more efficiently absorb fat-soluble nutrients (such as alpha- and beta-carotene and lutein) in other foods eaten in conjunction. For example, adding avocado to salads allows may allow you to absorb three to five times more carotenoids antioxidant molecules, which help protect your body against free radical damage. Other research has found that avocados can help improve lipid profiles in both healthy individuals and those with non optimized HDL/ total cholesterol levels. Tomatoes are often considered a vegetable, though in actuality they are a citrus fruit. Tomatoes are delicious eaten raw, in salads or on sandwiches, and they take on a unique sweetness when cooked. Tomatoes are such an important part of the American diet. Numerous studies have concluded that the more tomatoes people eat the lower their risks of certain cancers, especially lung, stomach and prostate cancers. A substance called lycopene, which is responsible for their red color, is thought to be the reason for this protection against some cancers. Processed tomatoes contain even more lycopene than raw ones. The process of cooking breaks down the cell walls, helping to release the lycopene. In addition, eating tomatoes with a little bit of fat, such as olive oil, helps lycopene to be better absorbed by the body. Tomatoes are also high in important antioxidants such as vitamin C and Vitamin A. These vitamins work to fend off DNA damage from free radicals. Consequently, tomatoes may help to ward off age related diseases such as atherosclerosis and diabetes.